SCOTT, originally Scot, a surname conjectured to have been at first assumed by, or conferred on, a native of Scotland, and afterwards adopted as a surname, when surnames became in use. Uchtredus filius Scoti, that is, Uchtred, the son of a Scot, is witness to an inquisition respecting possessions of the church of Glasgow in the reign of Alexander I. (1107-1124); also to the foundation charter of the abbey of Holyrood by David I. in 1128, as is also Herbert Scot, and to that of the abbacy of Selkirk in 1130. He was called Uchtredus filius Scoti, to distinguish him from others of the same Christian name, probably Saxons or Normans. His son, Richard, called Richard le Scot, is witness to a charter of Robert, bishop of St. Andrews, founder of the priory of that place, who died in 1158. Others bearing this surname, living in that and the following century, are mentioned by Douglas and Nisbet as occurring in old charters. John Scott was bishop of Dunkeld from 1200 to 1203, and Matthew Scott, bishop of Dunkeld, held the office of chancellor of Scotland from 1227 to 1231. The above-mentioned Richard le Scot is said to have had two sons, Richard, whose name appears in the Ragman Roll as Richard le Scot de Murthockston, and Michael. The former was ancestor of the Scotts of Murdockstone, of whom came the Buccleuch family, and the latter was progenitor of the Scotts of Balwearie in Fifeshire, now represented by the Scotts of Ancrum, baronets. The younger son, Sir Michael Scott, was possessed of a considerable estate in Fifeshire in the reign of William the Lion. From the chartulary of Dunfermline, it is ascertained that he married Margaret, daughter of Duncan Syras of Syras, and obtained with her the lands of Ceres. He had a son, Duncan, who succeeded him and who had two sons, the younger of whom was named Gilbert. The elder son, Sir Michael Scott, was knighted by Alexander II., and was one of the assize upon a perambulation of the marches between the monastery of Dunfermline and the lands of Dundaff in 1231. By his wife, Margaret, daughter and sole heiress of Sir Richard Balwearie of Balwearie, he got that estate in the parish of Abbotshall. He had a son, Sir Michael Scott of Balwearie and Scotscraig, the famous wizard, of whom a memoir is given below. In the Ragman Roll is the name of Michael Scott, one of the Scottish barons who swore fealty to Edward I. of England in 1296, said to have been this learned personage. He had two sons: Sir Henry, and Duncan Scott, proprietor of lands in Forfarshire, and progenitor of the Scotts in the North. The elder son, Sir Henry Scott, died in the beginning of the reign of David II. His son, Sir Andrew Scott of Balwearie, distinguished himself by his patriotism, and was slain at the taking of Berwick by the Scots in 1355. He left an infant son, afterwards Sir William Scott of Balwearie, who died in the end of the reign of King Robert III. His son, Sir Michael Scott of Balwearie, was one of the hostages for James I. in 1424, and died in the following reign. Sir Michael’s son, Sir William Scott of Balwearie, married Isabel, daughter of Sir John Moncrief of that ilk, and with one daughter, had two sons, Sir William, who succeeded him, and Alexander Scott of Fingask, Perthshire. He had two sons, William and James. The former, it is believed, died before his father. His son, Walter Scott, styled of Balwearie, having been deprived of all portion of the family estates, through the misconduct of his grandfather, entered the army, rose to the rank of colonel, and died unmarried in Flanders, during the reign of Charles I. Shortly before his death, he sent over from Holland, to Sir John Scott of Ancrum, baronet, the seal of the family of Balwearie, with a letter acknowledging him to be his heir male, which is still preserved in that family. In Colonel Walter Scott ended the whole male line of the ancient family of Scott of Balwearie, which had continued for sixteen generations, the eldest son having always succeeded during that long period. What is still more remarkable, from the time of the original Sir Michael Scott, who lived in the reign of William the Lion, till Sir James, the fourteenth baron, in whose time the estates of the family were lost, thirteen of the barons had attained the honour of knighthood, the only exception being Duncan, son of the first Sir Michael. The Scotts of Ancrum, Roxburghshire, descend from Andrew, the younger of the two sons of Sir William Scott of Balwearie above mentioned. This Andrew Scott lived in the time of Queen Mary, and had from his father the lands of Glendoich, on condition that at his death they were to return to the family. He obtained the lands of Kirkstyle in the parish of Kinfauns, Perthshire, which were sold by his great-grandson, Patrick Scott, who lived in the reign of James VI. The latter purchased Langshaw in the south of Scotland, and afterwards acquired the lands and barony of Ancrum. His son, Sir John Scott, obtained a charter under the great seal, in 1670, of the lands and barony of Ancrum, and was created a baronet of Nova Scotia, 27th October 1671, with remainder to his heirs male generally. He died in 1712, having been thrice married, first, to Elizabeth, daughter of Francis Scott, Esq. of Mangerton, and had by her five sons and five daughters; secondly, to Elizabeth, daughter of Sir William Bennet of Grubbet, by whom he had two daughters; and thirdly, to Barbara, daughter of Ker of Littledean, without issue. His eldest son, Sir Patrick Scott, second baronet, a lawyer of eminence, was at the Revolution summoned by the prince of Orange, to the Scottish convention in 1689, for the county of Selkirk. He was twice married. By his first wife, Anne, daughter of William Wallace, Esq. of Helington, he obtained a considerable fortune. By his second wife, Margaret, daughter of Sir William Scott of Harden, he had two sons and four daughters. The elder son, Sir John Scott, third baronet, married Christian, daughter of William Nisbet, Esq. of Dirlton, and had four sons and a daughter. He died 21st February 1746. His son, Sir William, fourth baronet, died 16th June 1769, and was succeeded by his nephew, Sir John Scott, fifth baronet. He married Harriet, daughter of William Graham of Gartmore, and had four daughters, and a son, Sir William, sixth baronet. The latter, born 26th July 1803, married Elizabeth, daughter and heiress of David Anderson, Esq. of Balgay, Forfarshire, with issue. James, second son of Sir James Scott, fourteenth baron of Balwearie, purchased the lands of Logie in Forfarshire, and was the ancestor of several families of the name in that county. His son, also James Scott of Logie, acquired considerable landed property, and was enabled to bestow an estate on each of his six sons. These were James Scott of Logie; Robert Scott of Benholme; Hercules Scott of Brotherton; Patrick Scott of Craig, from whom descended Sir David Scott, baronet of Duninald, nephew of lady Sibbald, wife of Sir James Sibbald, baronet (see SIBBALD); John, and David. His grandson, James Scott of Logie, had three sons; James of Logie; Alexander of Baldovie; and David of Balhall. The second son, Alexander Scott of Baldovie, was father of John Scott, Esq., whose second son, William Scott, captain R.N., commanded the Bedford, 74, in the American war. He married his cousin, Janet, eighth daughter of Robert Scott of Duninald, and had two sons and two daughters. William, the elder son, a senior merchant in the Bengal civil service, with his wife, Emily, only child of Thomas Evans, Esq., was drowned in the Company’s ship Calcutta, which foundered in a hurricane in the Indian Ocean between 14th and 15th March 1809. He was succeeded in the representation of the family by his brother David, also a senior merchant in the Bengal civil service; married, with issue. The Scotts of the south of Scotland were among the most noted moss-troopers of their time. As most of the chief border families had popular epithets applied to them, as the ’haughty Humes,’ and the ‘bauld Rutherfords,’ they were called the ‘saucy Scotts,’ and the ‘cappit’ or irritable Scotts. The chief family of the name was that of Buccleuch, originally of Murdieston, Clydesdale. De Gerville, a French writer, says, “What is curious, the duke (of Buccleuch) seeks his surname in Normandy, and pretends that it was originally l’Escot.” The duke of Buccleuch, as descended from the unfortunate duke of Monmouth, illegitimate son of Charles II., is properly a Stewart in the male line, and the chieftainship of the once numerous and powerful border clan Scott, has devolved on Lord Polwarth, the head of the Scotts of Harden, of which family Sir Walter Scott, the celebrated novelist and poet, was a scion. Their device and motto, a crescent moon, with the words, “The moon will refill her horns,” indicate that they lived by border reiving or cattle lifting. Among the most ancient branches of the house of Buccleuch were the Scotts of Synton, in the counties of Rosburgh and Selkirk, from whom descended the Scotts of Harden. Their immediate ancestor was Walter Scott of Synton, who lived in the reigns of Robert II. and III. He is said (Douglas’ Baronage, p. 213) to have been the son or grandson of Michael Scott, who fell at the battle of Durham, 17th October 1346, the supposed son of Sir Richard le Scot, who obtained the lands of Murdieston in Lanarkshire by marriage, which were afterwards exchanged for the half of the barony of Branxholm, in Roxburghshire, as related under the head of BUCCLEUCH. Sir Walter Scott expressly states, however, that the house of Harden came off the Buccleuch family before the marriage of Sir Richard with the heiress of Murdieston, in 1296. (See Note to Lay of Last Minstrel). Robert Scott of Strickshaws, second son of Walter, the fifth in descent from Michael, had two sons, Walter, his heir, and William, progenitor of the Scotts of Harden. Walter, the elder brother, succeeded his uncle in the estate of Synton, and from James, his fourth son, came the Scotts of Satchells. His eldest son, George Scott of Synton, had a son, Walter, the father of another George Scott of Synton, who was the last of the original family styled of Synton. And from the plunder’d heaps on infant drew! His fluttering soul, and kiss’d her foster child. He shunn’d the cruel scenes of strife and war. The eldest son, Sir William Scott of Harden, was knighted by James VI. in the lifetime of his father. He had charters of various lands in the counties of Dumfries, Selkirk, Roxburgh, Berwick, and Peebles. During the civil troubles in Scotland in the reign of Charles I., he continued loyal to the king. He was one of the commissioners for conserving the treaty of Rippon, 16th November 1641, and in 1644 one of the committee of parliament. On 8th March following he was appointed one of the committee of estates, and on 7th March 1647, sheriff of Selkirkshire. For his attachment to the royal family he was fined by Cromwell in 1654, £3,000. He married, first, Agnes, daughter of Sir Gideon Murray of Elibank, treasurer-depute of Scotland, in the reign of James VI., and had by her five sons and three daughters. He married, secondly, Margaret, daughter of William Ker of Linton, without issue. His sons were: 1. Sir William, his heir. 2. Sir Gideon Scott of Highchester. 3. Walter, ancestor of the Scotts of Raeburn. 4. James, ancestor of the Scotts of Thirlestane; and 5. John, progenitor of the Scotts of Wool. He died in 1655, at an advanced age. According to tradition, his marriage with his first wife was thus brought about: In his youth, engaging in a foray upon the lands of Sir Giedon Murray of Elibank, he was overpowered by that barons’ retainers, and carried prisoner to his castle, now a heap of ruins, on the banks of the Tweed. Elibank was on the point of ordering him to be instantly hanged, when his more considerate dame interposed, suggesting that he was heir to a good estate, and that they had three unmarried daughters. To save his life, young Harden consented to wed the plainest of the three. His eldest son, Sir William Scott of Harden, was knighted by Charles II., immediately after the Restoration. His son, Sir William Scott of Harden, was engaged in the rebellion of the earl of Argyle, but obtained a remission from King James VII., dated 12th December 1685. He died in 1707, without issue, and was succeeded by his only brother, Robert Scott, till then styled of Iliston. The latter died, also without issue, in 1710, when the estates devolved on his nearest male heir, Walter Scott of Highchester, lineally descended from Sir Gideon Scott, second son of the first Sir William Scott of Harden, and grandson of “Auld Wat.” Sir Gideon, who by Charles I., was appointed sheriff of Roxburghshire, married Margaret, daughter of Sir Thomas Hamilton of Preston, and had by her two sons and three daughters. The countess died two years after the marriage, a girl of thirteen. The earl succeeded his father in Harden in 1672. The mantel-piece of one of the rooms in Harden castle commemorates his title, by bearing an earl’s coronet inscribed with the letters W.E.T., the initials of “Walter, earl of Tarras.” In 1683, his lordship joined in the treasonable designs of the duke of Monmouth, who had married his deceased wife’s sister, Anne, duchess of Buccleuch. A plan of insurrection was formed for a simultaneous rising in England and Scotland, and Lord Tarras engaged to take arms with his friends on the border. When apprehended he confessed his guilt, and threw himself on the king’s mercy. An attempt was made by the tyrannical government of that day to obtain from him evidence against Baillie of Jerviswood, whose nephew he was by his lady, and although his testimony was objected to, the objections were repelled by the court, and Baillie was condemned. His lordship was himself brought to trial 5th January 1685, and being found guilty, his titles and estates were forfeited and his arms ordered to be torn. He was confined in the castle of Edinburgh, and the time, place, and manner of his execution were left to the king. A remission was granted to him 5th February following, and he was at once set at liberty. He was rehabilitated by letter under the great seal 28th June 1687. He was one of the first who engaged in the Revolution of 1688. He died in 1693, aged about 48. By a second wife, Helen, eldest daughter of Thomas Hepburne of Humbie, he had three sons and three daughters. The eldest son, the Hon. Gideon Scott of Highchester, died in 1707, leaving two sons, Walter, who succeeded to Harden, and died in 1619; and John, who also inherited that estate, but dying without issue male in 1734, Harden devolved on his uncle, the Hon. Walter Scott, second son of the earl of Tarras. This gentleman was four times married, and by his third wife, Anne, a daughter of John Scott, Esq. of Gorrenbonny, he had, with two daughters, two sons, Walter, his heir, and Francis of Beechwood. The former was M.P. for Roxburghshire, from 1747 to 1765, in which latter year he was appointed general-receiver of the customs or cashier of excise in Scotland. He died in 1793. He married Lady Diana Hume Campbell, daughter of the third earl of Marchmont, Lord Polwarth, an alliance which opened the succession to the latter title in the peerage of Scotland to his only son, Hugh Scott, eleventh baron of Harden and fourth Lord Polwarth. The gathering word and place of rendezvous of the clan Scott was Bellenden, a place situated near the head of Borthwick water, in the centre of the possessions of the Scotts. What time, save Thirlestane alone. When James V. had assembled his nobility and their feudal retainers at Fala, in June 1542, for the purpose of invading England, and his peers obstinately refused to accompany him, Sir John Scott of Thirlestane alone declared himself ready to follow the king wherever he should lead, and with 70 lancers on horseback ranged himself under the king’s banner. For this loyal conduct, he had a warrant from the king, granting an augmentation to his arms of a border of fleurs de lis, about his crest, such as is in the royal banner, and also a bundle of lances above his helmet, with the motto, “Ready, aye ready.” His estates of Thirlestane, Gamescleugh, &c., as we learn from a note to the stanza above quoted, lay upon the river of Ettrick, and extended to St. Mary’s Loch, at the head of Yarrow. By his wife, a daughter of Scott of Allanhaugh, he had four sons; Robert, his successor; Simon, called Longspear, who was tutor of Thirlestane, and built the house of Gamescleuch; Arthur or Andrew Scott, from whom the families of Newburgh and Ravelburn are descended, and Adam, of Gilmanscleuch. The eldest son, Robert Scott of Thirlestane, warden-depute of the west borders, joined the association in support of King James VI. in 1567. By his wife, Margaret, daughter of Sir Walter Scott of Buccleuch, he had three sons, Robert, William, and Walter. William, the second son, had two sons. Walter, who died without issue, and Robert, who acquired the lands of Howpaisley, the original estate of the family, and dying without issue, left it to his cousin Patrick Scott, first designed of Tanlawhill, and afterwards of Thirlestane. Walter, the youngest son, married Janet, daughter of Sir Patrick Porteous of Hackshaw, and had two sons, Patrick just mentioned, and Simon, and two daughters, Marion and Margaret. Patrick Scott acquired the lands of Thirlestane from the elder branch of the family by purchasing the wadsets or mortgages, with which it was encumbered, and the payment of certain sums of money. In April 1654, he was fined £2,000 by Cromwell, but the fine was remitted by act of council, 17th July 1635. He died 22d June 1666. His eldest son, Sir Francis Scott of Thirlestane, was created a baronet, 22d August, 1666, to him and the heirs male of his body. He was member for Selkirkshire in the Scots parliament from 1693 to 1701, both inclusive, and was appointed master of works, with a salary of £300 per annum, 17th October 1704. He died at Edinburgh, 7th March, 1712, in his 67th year. A better thing than Horace ever wrote. My authority was my father, who told me he had it from his, and that he had it from his, who was Sir William’s son.” (See Johnson’s Scottish Musical Museum, with Notes by Stenhouse, vol. i. p. 121.) Several of his Latin poems are printed in a volume entitled ‘Selecta Poemata Archibaldi Pitcarnii, Med. Doctoris, Gul. Scot a Thirlestane Equitis, Thomae Kincadii, et aliorum.’ Edinb. 1727, 12mo. He married, in his father’s lifetime (marriage contract dated 15th December 1699), Elizabeth, mistress of Napier, and their son, Francis, became fifth Lord Napier. He married, secondly, Jean, daughter of Sir John Nisbet of Dirleton, widow of Sir William Scott of Harden, without issue. The Quaker-laird’s elder son, William Scott of Raeburn, a person of considerable erudition, married Anna, eldest daughter of Sir John Scott of Ancrum, baronet, and died 6th August, 1699. His widow married, secondly, in 1702, John Scott of Synton. With a daughter, Isabel, the wife of John Rutherford, M.D., he had a son, Walter Scott of Raeburn, who was killed in a duel by one of the Pringles of Crighton, near Selkirk, 3d October 1707, in a field still named Raeburn’s Meadow, at the early age of 24. He had married, 19th November 1703, Anne, third daughter of Hugh Scott of Gala, and had one son, William, and two daughters, Isobel and Anne. His only son, William Scott of Raeburn, married in 1743, being then in his fortieth year, Jean Elliot, and had a son, Walter Scott of Raeburn, and a daughter, Anne, the wife of Thomas, second son of Robert Scott of Sandyknowe. The Scotts of Tushielaw in Ettrick, at one period a powerful section of the clan Scott, were, like all the race, reavers and freebooters. Their tower of Tushielaw, now in ruins, is celebrated alike in song, tradition, and story. The exploits of Adam Scott of Tushielaw, one of the most famous of their chiefs, and usually called “King of the thieves” and “King of the border,” with the excesses of the other border barons, roused the wrath of James V., and in 1528, he “made proclamation to all lords, barons, gentlemen, landwardmen, and freeholders, that they should compeer at Edinburgh, with a month’s victuals, to pass with the king where he pleased, to danton the thieves of Tiviotdale, Annandale, Liddisdale, and other parts of that country; and also warned all gentlemen that had good dogs to bring them, that he might hunt in the said country as he pleased.” In the course of this excursion, guided by some of the borderers, the king penetrated into the inmost recesses of Eusdale and Teviotdale, and seizing Cockburn of Henderland and Scott of Tushielaw, one morning before breakfast, summarily hung them in front of their own strongholds. The old ash-tree on which Scott of Tushielaw was suspended is said to be still standing among the ruins, and is still called the Gallows tree. It is asserted to bear along its branches numerous nicks and hollows, traced by ropes, in the ruthless execution of wretched captives, on whom that bold and reckless border marauder inflicted the fate which eventually became his own. The Scotts of Malleny, Mid Lothian, branched off from the house of Murdieston, previous to the ancestor of the Buccleuch family exchanging that estate for the half of the barony of Branksome. James Scott of Scotsloch, the first of the family in Mid Lothian, appears to have settled there in the reign of Queen Mary. His son, Laurence Scott of Harprig, was, in the reign of Charles I., clerk to the privy council, and also one of the clerks of session. He had three sons, Sir William, his successor; James, who received from his father the lands of Bonnytoun, Linlithgowshire; and Laurence, progenitor of the Scotts of Bavalaw. The eldest son, Sir William Scott of Clerkington, was, in November 1641, knighted by Charles I. In June 1649 he was appointed one of the ordinary lords of session, when he took the title of Lord Clerkington. He was also one of the committee of estates and planters of kirks. He was twice married. By his first wife, a daughter of Morrison of Prestongrange, he had one son, Laurence; and by his second wife, Barbara, daughter of Sir John Dalmahoy of Dalmahoy, baronet, he had three sons and three daughters. The sons were John, the first styled of Malleny; James, of Scotsloch; and Robert, dean of Hamilton. The eldest son, Laurence Scott of Clerkington, married a sister of his father’s second wife, and having only two daughters, was succeeded by his brother of the half-blood, John Scott, who received from his father in patrimony, the lands and barony of Malleny, in the parish of Currie, Mid Lothian, and it became the chief title of the family. He had, with two daughters, two sons, Thomas and William. The latter, an advocate, was twice married, first, to Magdalene, daughter and heiress of William Blair, Esq. of Blair, by whom he had one son, William; and, secondly, to Catherine, only daughter of Alexander Tait, merchant, Edinburgh, and had by her five sons and six daughters. William, the only son of the first marriage, having inherited the estate of Blair, assumed that surname, and dying without issue in 1732, he settled the lands on the children of his father’s second marriage, who all in consequence took the name of Blair. John Scott of Malleny’s elder son, Thomas, succeeded to the estate in 1709. His son, John Scott of Malleny, married Susan, daughter of Lord William Hay of Newhall, third son of the second marquis of Tweeddale, and had seven sons and four daughters. The eldest son, General Thomas Scott of Malleny, born 25th December 1745, entered the army as an ensign in the 24th regiment, 20th May 1761. During the whole of the campaign of the following year, he served under Prince Ferdinand, and at the battle of Wellenstall he carried the colours of his regiment, as he did also at the attack of the British picquets on the Fulda. In 1763 he returned to England, and in 1765 was promoted to a lieutenancy. In 1776 he accompanied his regiment to America, and served two campaigns under General Burgoyne, with a company of marksmen attached to a large body of Indians. He conducted himself so greatly to the satisfaction of his commanding officer, Brigadier-general Frazer, that he twice received thanks in public orders. After the battle of the 19th September, 1777, the critical situation of Burgoyne rendering it indispensably necessary that the commander-in-chief, Sir Henry Clinton, should be informed of it, Captain Scott, who was well known to be an excellent pedestrian, was one of two officers selected to go on this perilous enterprise by different routes. This mission he executed with the greatest dexterity and success. Having secured the dispatches in his rifle, he assumed the dress of a pedlar, and in that disguise passed safely through the enemy’s tents. His fearless conduct on this occasion was acknowledged by a handsome pension, without any solicitation on his part, being settled on him for life. In 1788 he returned to Europe. In 1791 he served, with a detachment of the 53d regiment, for six months on board his majesty’s ship, Hannibal, commanded by Sir John Colpoys. In 1793, when the duke of York was sent to Flanders at the head of a British army to oppose the French revolutionary forces, Captain Scott, under Sir Ralph Abercromby, accompanied the expedition, and was present at the siege of Valenciennes, which surrendered July 26, and at that of Dunkirk, in August following; also, in the attack in which the Austrian general D’Alton was killed. He was subsequently with the 53d regiment in garrison in Nieuport, when it was besieged by the French, and received his commission as major for his exertions in its defence. He was attached to the staff of Prince William of Gloucester during the three days that he commanded a brigade, and was present at the attack of the village of Premont. In the action of the 24th May 1794, he was wounded in the inside of the right thigh by a musket-ball. In 1794 he was appointed lieutenant-colonel of one of the battalions of the 94th. He afterwards served in the Mysore country in South India, and was at the capture of Seringapatam, May 4, 1799. In 1800, in consequence of bad health, he left Hindostan for Europe, but the Indiaman in which he was a passenger, was boarded in the British Channel, and taken by a French privateer. After being detained some weeks at Cherbourg, colonel Scott was exchanged, in consequence of an application to the French government, by the desire of the duke of York, IN 1801 he was appointed colonel by brevet; in 1802, inspecting field officer of the Edinburgh recruiting district; in 1803, deputy-inspector-general of the recruiting service in North Britain; in 1804, brigadier-general; in 1808, major-general on the staff; in 1813, lieutenant-general; and in 1820, full general. He died in 1841, at the advanced age of 96, and was succeeded by his nephew, Carteret George Scott, Esq. of Malleny, at one period a captain in the East India Company’s service; a magistrate and deputy-lieutenant of Mid Lothian; second but eldest surviving son of Francis Carteret Scott, Esq., collector of customs at Montego Bay, Jamaica, from 1774 to 1800. The Scotts of Duninald, in the parish of Craig, Forfarshire, were descended from Patrick Scott of Craig, (born in 1623, died in 1690), the son of James Scott, the first of Logie. About the beginning of the 18th century the three contiguous estates of Rossie, Usan, and Duninald, were the property of three brothers of the name of Scott, who are said to have obtained them in marriage with three sisters, heiresses of the same. Patrick Scott of Rossie, the son of Patrick Scott of Craig above mentioned, succeeded, after the death of his brothers, to Duninald and Usan. His son, Robert Scott of Duninald, born in 1705, was for many years M.P. for Forfarshire. During the rebellion of 1745, he was a faithful adherent of the house of Hanover, and when the rebels arrived in Montrose a party of them went to Duninald house, and threatened him with instant death, for his support of the government. His wife, Ann Middleton of Seton, Aberdeenshire, usually called Lady Duninald, entered the hall at the time they had her husband in their hands. Being a woman of a fine appearance and manner, and near her accouchement, her entreaties that they would spare his life prevailed; but he was carried off to the tollbooth of Montrose, and there immured. On the advance of the duke of Cumberland, however, he was at once set at liberty. He died in December 1780. His son, David Scott of Duninald, married Mrs. Louisa Jervis, a widow, daughter and coheiress of William Delagard, Esq., and died Oct. 4, 1805. He had one son, also named David, born July 25, 1782, and 3 daughters. Mrs. Scott’s sister, Elizabeth, the other coheiress, married James Sibbald, Esq. of Sillwood Park, Sussex, who was created a baronet of the United Kingdom, Dec. 13, 1806, and died, issueless, Dec. 17, 1819. As the baronetcy’s remainder, in default of male issue, was to the nephew of his wife, the only son of Mr. David Scott of Duninald, accordingly, became Sir David Scott, 2d bart. Of Sillwood Park. On succeeding to this title and estate, he sold Duninald to Patrick Arklay, Esq. Sir David was a knight of the order of the Guelphs of Hanover, and for some years M.P. for Yarmouth. He died June 18, 1851. By his wife, Caroline, daughter and coheiress of Benjamin Grindall, Esq., of the Bengal Civil service, a lineal descendant of Edmund Grindall, archbishop of Canterbury in the time of Queen Elizabeth, he had 2 sons and 3 daughters. His elder son, Sir James Sibbald David Scott, 3d baronet of Sillwood Park, born June 14, 1814, graduated at Christ church, Oxford, B.A., in 1835; a deputy-lieutenant and captain in the royal Sussex militia, 1846. By his wife, Harriet Anne, only daughter of Henry Shank, Esq. of Casterig, Fifeshire, he has 3 sons and 3 daughters. Heir, his son Michael David Sibbald, born in 1849. The Scotts of Benholme, Forfarshire, descended from the family of Logie, are represented by Hercules James Robertson, a lord of session under the title of Lord Benholme, the son of George Robertson-Scott, Esq., by his wife Isabella Scott of Benholme and Hedderwick. Born in Edinburgh in 1796, he was educated at the High school and university of Edinburgh, and passed advocate in 1817. In 1842, he was appointed sheriff of Renfrewshire, and in 1853 raised to the bench as Lord Benholme. IN 1829 he married the youngest daughter of the Right Hon. Charles Hope of Granton, lord-president of the court of session. His wife died in 1840. The Scotts of Brotherton, Kincardineshire, are also a branch of the Scotts of Logie. Hercules Scott, born in 1621, third son of James Scott, the first of Logie, had, with five daughters, two sons, Hercules, the first of Brotherton, and James Scott of Commieston, a general in the army. The elder son, the laird of Brotherton, married in 1707 Helen, daughter of Sir Charles Ramsay of Balmain, baronet. Their marriage contract, signed by seventeen witnesses, and dated at Fasque in 1706, in mentioned as a curious old document. The Chevalier St. George, a short time previously to his embarkation for France from Montrose in 1716, was concealed in the garden of Brotherton. The last night he was in Scotland he slept in the house of Scott of Logie. Hercules Scott died in 1747, leaving two sons and six daughters. His elder son, James Scott of Brotherton, born in 1719, was succeeded on his death in 1807 by his nephew, James, son of his brother, David Scott of Nether Benholme. Dying Sept. 22, 1844, he was succeeded by his brother, David Scott, Esq. of Brotherton, born June 16, 1782. The latter died Dec. 18, 1859. His son, Hercules Scott, Bengal civil service, born in 1823, succeeded to Brotherton. He also left eight daughters. Of the Scotts of Scotstarvet, Fifeshire, the immediate ancestor was David, second son of Sir David Scott of Buccleuch, the eleventh generation of that noble house in a direct male line. David Scott, designed of Allanhaugh and Whitchester, lived in the reigns of James IV. and V., and died at an advanced age about 1530, leaving three sons, Robert, Alexander, and James. The youngest, a churchman, was provost of Corstorphine, where he built a manse for himself and his successors in office. He was clerk of the treasury and a lord of session on the spiritual side of the bench, according to the distinctions of that court on its first institution in Scotland. Sir Alexander Scott, the second son, was by James V., in 1534, appointed vice-register of Scotland, and died six years thereafter. His son, Robert Scott, acquired the lands of Knightspottie, and was appointed clerk of the parliament and director of the chancery, 17th October 1579. With one daughter, he had two sons, Robert and James, the latter designed of Vogrie. He resigned his office of director of the chancery, first, in favour of his elder son, Robert, who predeceased him in 1588, and, secondly, in favour of Sir William Scott of Ardross, his stepson, to be held till his grandson, John, son of Robert, became of age. The latter succeeded his grandfather 28th March 1592, when he was only seven years of age. He was the celebrated Sir John Scott of Scotstarvet, and, on coming of age, he obtained the office of director of the chancery. (Douglas’ Baronage, p. 222.) Among other charters he had one of the lands and barony of Tarvet, Fifeshire, dated 28th November 1611. These lands he called Scotstarvet. He was knighted by King James VI., in 1617, and appointed of his privy council. Sir James Balfour styles him “a busy man in foul weather.” In Brunton and Haig’s Senators of the College of Justice, (p. 280), there is a somewhat elaborate life of him. We learn from it that he was admitted an extraordinary lord of session 14th January 1629, when he took the judicial title of Lord Scotstarvet. He was displaced in November 1630, and appointed an ordinary lord 28th July 1632. He was one of the four judges of the court who, in 1639, refused to take the king’s covenant when tendered by the royal commissioner, in respect that he did not conceive the innovations which had been introduced into the church since 1580, could subsist with the covenants then subscribed, of which it was a copy, and that it belonged to the General Assembly to clear doubts of this nature. (Balfour’s Annals, vol. ii. p. 147.) IN 1640, he was appointed one of the committee of estates established for the defence of the country. In November 1641, he was reappointed by the king, with consent of the estates, a judge ad vitam aut culpam. On 1st February 1645, he was named one of the commissioners of the exchequer, and in 1648 and 1649, a member of the committee of war. During the commonwealth he lived retired, and in 1654 he was fined by Cromwell £1,500 sterling. At the Restoration, notwithstanding his well-known loyalty, his office of director of the chancery was taken from him and bestowed on another, and by Charles II. he was fined £6,000 Scots. He died in 1570, in his 84th year. According to Nisbet (Heraldry, vol. ii. p. 293), he was “a bountiful patron of men of learning, who came to him from all quarters, so that his house became a kind of college.” Among others, he encouraged Timothy Pont, in his survey of Scotland, and prevailed upon Sir Robert Gordon of Straloch to prepare the maps which he left, for publication. They compose the ‘Theatrum Scotiae,’ published by John Bleau in the sixth volume of his celebrated Atlas, which appeared in 1662, dedicated to Sir John Scott of Scotstarvet. Being anxious that the maps of the different counties should be accompanied by correct topographical descriptions, Sir John petitioned the General Assembly that these might be furnished by some of the ministers of every parish, in the way that a century and a half later was done for the New Statistical Account of Scotland; but although his request was acceded to, very few complied with the order. In consequence, most of the descriptions were supplied by himself and his friends. So anxious was he as to the publication of this great work that he made a second visit to Holland for the purpose of superintending it, and, according to Bleau, spent whole days in his house in Amsterdam, writing the description of the counties from memory. (Senators of College of Justice, p. 282.) In the old tower of Scotstarvet, parish of Ceres, he wrote his curious work alliteratively entitled ‘The Staggering State of Scots Statesmen, by Sir John Scott of Scotstarvet,’ published by Ruddiman in 1754. He took a great interest in the work entitled ‘Dalitiae Poetarum Scotorum,’ edited by Arthur Johnston, and to superintend the printing of it, we are told, that he took a voyage to Holland, and disbursed “a hundred double pieces.” Some of his pieces of another kind appear among the contents, but, as has been remarked, they are not quite deserving of the high compliment paid to him on their account, that he shines among the other poets whose works are contained there as a moon among stars. Sir John Scott of Scotstarvet, among other benefits conferred on learning, founded a professorship for teaching the Latin language in St. Leonard’s college, St. Andrews, and gave a mortification to the smiths of Glasgow, for which his descendants had the presenting of apprentices. (Sibbald’s History of Fife, ed. 1803, p. 344.) He was three times married; first, to Anne, daughter of Sir John Drummond of Hawthornden, by whom he had two sons and seven daughters; secondly, to Margaret, daughter of James Melville of Hallhill, by whom he had one son, George Scott of Pitlochie; and, thirdly, to Margaret, daughter of Monypenny of Pitmilly, relict of Rigg of Aitherney, by whom he had a son, Walter Scott of Edenshead. His eldest son, Sir James Scott, conjunct director of chancery with his father, was knighted by Charles I. He predeceased his father in 1650, and his elder son, James Scott, succeeded to Scotstarvet on his grandfather’s death twenty years thereafter. Dying without issue, James Scott of Scotstarvet was succeeded by his brother David, who greatly improved the family estate, and died in 1718, in his 73d year. The son of the latter, David Scott of Scotstarvet, advocate, was long a member of the Imperial parliament. He died in 1766. His elder son, David Scott of Scotstarvet, was succeeded by his brother Major-general John Scott, who purchased the estate of Balcomie, parish of Crail, and was M.P. for Fifeshire. General Scott died without male issue. His eldest daughter married in 1795 the marquis of Titchfield, who in consequence assumed the name of Scott in addition to his own of Bentinck. She subsequently sold Scotstarvet and the other Fifeshire estates belonging to herself. Her husband became fourth duke of Portland in 1809, and the duchess died in 1844, leaving issue. Her eldest son, William John Cavendish Scott-Bentinck, succeeded his father as fifth duke of Portland in 1856. The Scotts of Gala, Roxburghshire, are descended from Hugh, third son of Walter Scott of Harden, by his wife, Mary Scott, the Flower of Yarrow. This Hugh Scott lived in the reigns of James I. and Charles I., and was designed of Deuchar. He married Jean, eldest daughter of Sir James Hop-Pringle of Galashiels, and had several sons, namely, James, his heir; Walter, a major in the army; George, progenitor of the Scotts of Auchty-Donald, Aberdeenshire; John, settled in Italy; and David, a surgeon in Edinburgh. On the death of her only brother, John Hop Pringle, without issue, their mother became heir of line of that ancient family. Hugh Scott died in 1640 or 1641. His eldest son and successor, James, got a charter of the lands and barony of Gala, dated 9th June 1640, and was the first designed by that name. His son, Hugh Scott of Gala, by his wife, a daughter of Sir James Kerr of Cavers, had five sons and three daughters. Sir James, the eldest son, married Euphemia, daughter of Sir William Douglas of Cavers, heritable sheriff of Roxburghshire, and had four sons and two daughters. Hugh, the eldest son, married Elizabeth, daughter of Colonel John Stewart of Stewartfield, near Edinburgh, and had two sons and 8 daughters. The elder son, John Scott of Gala, was cousin-german and heir of line of the last John Stewart of Stewartfield. By his wife, Anne, only daughter of Colonel George Makdougall and Makerston, he had 1 son, and 2 daughters. In August 1815 John Scott of Gala, an intimate friend of his kinsman Sir Walter Scott, accompanied him on his visit to the field of Waterloo, and returned with him to Scotland. His reminiscences of Sir Walter in London in 1831, are published in Lockhart’s Life of Scott. Mr. Scott of Gala died at Edinburgh, April 19, 1840, and was succeeded by his son, Hugh Scott of Gala, born in 1822; at one time Captain 92d Highlanders, and major of militia; appointed in 1848 one of the deputy lieutenants of Selkirkshire; married in 1857 Elizabeth Isabella, daughter of Capt. Johnstone Gordon of Craig, with issue. Heir, his son, John Henry Francis Kinniard, born in 1859. Sir Alexander Scott of Hassendean fell at the battle of Flodden in September 1513. Among the border barons who in 1530 neglected to fulfil their bonds there was a William Scott of Hassendean. He is again mentioned in 1539, as having been robbed by Thomas Turnbull of Rawflat, of some important legal documents. The Criminal Trials record the slaughter in 1564 of a David Scott, laird of Hassendean, by William Elliot of Horsliehill. It does not appear to be ascertained at what period the male line of this family failed. Perhaps it was at the death of the said David Scott. In the appendix to Scott of Satchell’s curious work, it is stated that the lands returned by purchase to the Scotts of Buccleuch, while the representation of the family devolved on William Scott of Burnhead and Crowhill, as lineal male descendant of the first John Scott of Burnhead, younger brother of David Scott of Hassendean, and second son of Sir Walter Scott of Kirkurd, (see New Stat. Account of Scotland, vol. iii. p. 368). The original barony of Hassendean now forms the estates of Hassendean-bank, Hassendean-burn, and Teviot-bank, and some lands belonging to the duke of Buccleuch. In old charters the name was spelled Halstaneadene, Halstenden, Halstansdene, and Hastendene, supposed to signify dean of the holy stone, or Halstein’s dean, Halstean being a common Scandinavian name. The modern name Hassendean, simply a softened form of the old one, has been changed into Hazeldean in song merely by the caprice of poets. Both Sir Walter Scott and Leyden (in his Scenes of Infancy) are wrong when they give Hazeldean as the ancient name. SCOTT, MICHAEL, a celebrated philosopher of the thirteenth century, whose knowledge of the more abstruse branches of learning acquired for him the reputation of a magician, was born about 1214, at his paternal estate of Balwearie, in the parish of Abbotshall, Fifeshire. He early became versant in the occult sciences, and in his youth, after studying with unusual success at home, went to Oxford, where he had Roger Bacon for a fellow-student, who afterwards was not sparing in his censures of him, and in no very measured phrase accused him of being both a plagiarist and an impostor. He then proceeded to the university of Paris, where he remained for some years, being styled Michael the Mathematician, and for his attainments in theology, he obtained the degree of doctor in divinity. He subsequently repaired to the university of Padua, and afterwards resided for some time at Toledo in Spain. Besides mathematics, chemistry and medicine, astronomy and the sister art of astrology became his favourite pursuits. IN Spain he acquired an intimate knowledge of the Arabic language, which, in the general ignorance of the Greek which then prevailed, was the only source whence an acquaintance with the Aristotelian philosophy could be obtained. From the Arabic of the famous physician and philosopher Avicenna, who flourished in the eleventh century, he translated into Latin Aristotle’s nineteen books of the History of animals. This work recommended him to the notice of the Emperor Frederick II. of Germany, a prince the most eminent of his time, both for his own learning and for the encouragement of learned men. He invited him to his court, and appointed him royal astrologer. At that monarch’s desire he translated from the Arabic the greater part of the works of Aristotle, assisted by one Andrew a Jew. He predicted the time, place, and circumstances of the Emperor Frederick’s death, and his prophecy is said to have come true in all its details. After leaving his court, he practiced for some time as a physician with success, and then repaired to England. He was received with great favour by Edward I., and permitted by him to return to Scotland. He arrived in his own country shortly before the death of Alexander III. At this time he is styled Sir Michael Scott, having been knighted by that monarch. IN 1290 he was, by the regents of Scotland, appointed one of the ambassadors sent to Norway to bring over the infant queen Margaret styled the Maiden of Norway. In this embassy, Sir David Wemyss, another Fifeshire gentleman, was associated with him. They succeeded so far in their mission as to get the young princess intrusted to their care; but the royal infant, as is well known, sickened on her passage to Scotland, and died in Orkney, an event which involved Scotland in many dire calamities. Sir Michael Scott’s name does not again appear in history. He died at an advanced age about 1300, and by some accounts he is represented as having been buried at Home-Cultram in Cumberland, where Henry, son of David I. of Scotland, had founded a Cistercian abbey, of which Lysons says Michael Scott was a monk about the year 1190. It is more generally believed, however, that he was buried in Melrose abbey, where his magical books are said to have been buried with him. Will be found in the notes appended to ‘The Lay of the Last Minstrel.’ “It is well known,” says Tytler, in his ‘Lives of Scottish Worthies,’ (vol. i. p. 121), “that many traditions are still prevalent in Scotland concerning the extraordinary powers of the wizard; and if we consider the thick cloud of ignorance which overspread the country at the period of his return from the continent, and the very small materials which are required by Superstition as a groundwork for her dark and mysterious stories, we shall not wonder at the result. The Arabic books which he brought along with him, the apparatus of his laboratory, his mathematical and astronomical instruments, the oriental costume generally worn by the astrologers of the times, and the appearance of the white-haired and venerable sage, as he sat on the roof of his tower of Balwearie, observing the face of the heavens, and conversing with the stars, were all amply sufficient to impress the minds of the vulgar with awe and terror.” His own productions are ‘De Procreatione, et Hominis Phisionomia,’ also printed under the title of ‘De Secretis Naturae;’ a chemical tract on the transmutation of metals into gold, styled ‘De Natura Solis et Lunae;’ and ‘Mensa Philosophica,’ a treatise relating to the visionary sciences of chiromancy and astrology. His commentary on the ‘Sphere of Sacrobosco’ was thought worthy of being presented to the learned world of Italy at so late a period as 1495. SCOTT, DAVID, author of a History of Scotland, was born near Haddington, in 1675, and became a lawyer in Edinburgh. After the Revolution, he was for some time imprisoned for his Jacobite principles, His History was published in 1727 in folio, but is now little known. He died at Haddington in 1742. SCOTT, HELENUS, M.D., an able physician, the son of a clergyman, was born at Dundee, and received his grammatical education there. He studied at Aberdeen and Edinburgh for the medical profession, and, after visiting London, traveled as far as Venice, with the intention of proceeding overland to Bombay; but the want of money compelled him to return to England, where he married. Shortly after he obtained an appointment in the East Indies, and having written an entertaining Romance, styled ‘The Adventures of a Rupee,’ he sent it to a friend in London, and it was published in one small volume in 1782. During his residence in India, he acquired a considerable fortune by his practice. He died on his voyage to New South Wales, November 16, 1821. SCOTT, SIR WALTER, baronet, a distinguished poet and the most celebrated novelist of his day, born at Edinburgh, August 15, 1771, was the third child of Mr. Walter Scott, writer to the signet, the son of Mr. Robert Scott, farmer at Sandyknowe in Roxburghshire, lineally descended from the Scots of Harden (for the pedigree of the family, see above). His mother, Anne Rutherford, was the daughter of Dr. John Rutherford, professor of the practice of medicine in the university of Edinburgh. His maternal grandmother was Jean Swinton, a daughter of Sir John Swinton of Swinton, Berwickshire (see SWINTON, surname). His father’s family consisted of eleven sons and one daughter. An elder brother, Robert, was an officer first in the navy, and afterwards in the East India Company’s service. Another brother, John, major in a foot regiment, was obliged to retire from the army on account of his health. Thomas, the next brother to Sir Walter, a writer to the signet like his father, was for some years factor to the marquis of Abercorn, but died in Canada in 1822, in the capacity of paymaster to the 70th regiment. The youngest brother, Daniel, died on his return from the West Indies, in 1806. The house in which the novelist was born stood at the head of the College wynd, a narrow alley leading from the Cowgate to the gate of the old college of Edinburgh, and was long since pulled down to make way for the new university. While yet a child of three years old, Sir Walter was removed, on account of his delicate health, to the farm of his paternal grandfather at Sandyknowe, situated near the bottom of Leader water, among the romantic hills of Roxburghshire. In the neighbourhood stands the deserted and ruined border fort of Smailholm Tower. In the fourth year of his age he was taken to Bath for the benefit of his health, where he spent about a twelve-month, and acquired the rudiments of reading at a day-school kept by an old dame. He then returned to Edinburgh, and thereafter went back to Sandyknowe, where he chiefly resided till his eighth year, and where he stored his mind with much of that traditionary lore which he afterwards introduced with such admirable effect into his writings. At this time he spent half-a-year with an aunt at Kelso, where he attended a school, kept by a Mr. Launcelot Whale, and had for school-fellows, James and John Ballantyne, the printers, with whom he afterwards became so closely associated. In 1779 he was sent to the second class of the High school of Edinburgh, at that time superintended by Mr. Luke Fraser, and two years afterwards was transferred to the rector’s class, then taught by Dr. Alexander Adam, but he never was in any way remarkable for his proficiency as a scholar. He quitted the High school in 1783, and at that early period of his life he had a strong desire to enter the army, but this his lameness prevented, the malady which afflicted his early years having had the effect of contracting his right leg, so that he could hardly walk erect. In October 1783 he entered the university of Edinburgh; but the precarious state of his health interfered much with his academical studies. He appears to have attended only the Greek and Latin classes for two seasons, and that of logic one season. At the age of fifteen, the rupture of a blood-vessel caused him to be confined for some time to his bed. During this illness, he had recourse for amusement to the books contained in the circulating library founded by Allan Ramsay, and he read nearly all the old romances, old plays, and epic poetry, which the library contained. After his sixteenth year his health gradually improved, and being designed for the bar, he attended the lectures on civil and municipal law in the university, as well as those on history. On May 15, 1786, he was apprenticed to his father as a writer to the signet, to enable him to acquire a technical knowledge of his profession. About this period he applied himself to the study of foreign languages, and soon made a considerable proficiency in Italian, French, and especially German. He passed advocate July 10, 1792, and in the course of time obtained a tolerable practice at the bar. In 1796 his first publication, a thin quarto, made its appearance, without his name, being a translation of two of Burger’s Ballads, entitled ‘Leonore,’ and ‘The Wild Huntsman.’ The success of this work was by no means flattering, the translator having distributed so many copies among his friends as materially to injure the sale. In the spring of 1797 his loyal feelings were gratified by his being made quarter-master-general of the Edinburgh corps of volunteer cavalry. IN December of that year he married Miss Charlotte Margaret Carpenter, a young French lady of good parentage and some fortune, daughter of a gentleman of Lyons, whom he had accidentally met in the preceding autumn, while on an excursion to Gilsland Wells in Cumberland. Early in 1799 he published at London ‘Goetz of Berlichingen,’ a tragedy, translated from the German of Goethe. The ballad called ‘Glenfinlas’ was his first original poem. His next was ‘The Eve of St. John,’ the scene of which was at Smailholm Tower. Having, on his marriage, taken up his residence at Lasswade, a village south of Edinburgh, he was accustomed occasionally to make what he called “raids” into Liddesdale, for the purpose of collecting the ballad poetry of that romantic district. He not only visited many of the scenes alluded to in the metrical narratives, but gathered all the local anecdotes and legends preserved by tradition among the peasantry; and of the extraordinary retentiveness of his memory at this period several interesting proofs have been recorded. In December 1799 he obtained, through the influence of the duke of Buccleuch, the crown appointment of sheriff-depute of Selkirkshire, to which was attached a salary of £300 a-year, when he removed to Ashestiel, on the banks of the Tweed. His first publication of any note was ‘The Minstrelsy of the Scottish Border,’ consisting of his Liddesdale collections, and various other contributions; which work issued from the printing –press of Mr. James Ballantyne of Kelso, in 1802, in two volumes 8vo. In the ensuing year he added a third volume, consisting chiefly of original ballads, by himself and others. In 1804 he published the ancient minstrel tale of ‘Sir Tristrem,’ said to have been composed by Thomas the Rhymer in the 13th century, the notes to which showed the extent of his acquirements in metrical antiquities. In 1805 appeared his first decidedly original poem, ‘The Lay of the Last Minstrel;’ the poetical beauty and descriptive power of which, with the singular construction of the verse, at once attracted public attention, and secured for the work an extensive popularity. This work produced to him £600. In the spring of 1806, on the retirement of Mr. George Home, he obtained the reversionary appointment of one of the principal clerks in the court of session, the duties of which he performed without salary till the death of his predecessor in 1812, when he became entitled to the full emoluments, which usually amounted to £1,200 a-year. In 1808 he brought out his second considerable poem, ‘Marmion,’ for which he received from Constable a thousand pounds, a sum required by the author, it is said, for “the special purpose of assisting a friend who was then distressed.” A few weeks thereafter he produced, in eighteen volumes, ‘The Works of John Dryden; illustrated with Notes, Historical, Critical, and Explanatory, and a Life of the Author,’ price nine guineas. In the same year he edited ‘Captain George Carleton’s Memoirs;’ Strutt’s ‘Queen Hoo Hall,’ a romance left unfinished by the death of the author; and ‘Ancient Times,’ a drama. In 1809 he assisted Mr. Clifford in editing ‘The State Papers and Letters of Sir Ralph Sadler,’ in two vols. 4to, with a life and historical notes. In the same year he contributed similar assistance to a new edition of Lord Somers’s collection of Tracts, which appeared in twelve volumes 4to, and also edited ‘The Memoirs of Sir Robert Cary.’ Mr. Ballantyne having removed to Edinburgh, commenced printer on a large scale, in partnership, as has been proved by subsequent disclosures, with Scott, who had become concerned with the prose works above mentioned from his connection with Ballantyne. He now engaged as a contributor to the Edinburgh Annual Register, started by Mr. Southey, the first volume of which for 1808 appeared in 1810 in two parts. It was conducted in a spirited manner for a few years, but not meeting with adequate support, was eventually discontinued. In June 1810 he published his ‘Lady of the Lake,’ suggested by the deep impressions which had been left on his mind by the romantic scenery of Perthshire. This poem, which is certainly one of the finest specimens of his poetical genius, met with extraordinary success. In 1811 appeared ‘The Vision of Don Roderick,’ and in 1813 ‘Rokeby,’ the reception of which was decidedly unfavourable. To retrieve his laurels, he published, in 1814, ‘The Lord of the Isles;’ the sale of which was by no means encouraging. The public, become familiar with his style, had ceased to be captivated by it, and, with proverbial fickleness, had transferred their homage to the more impassioned muse of Byron, now rising into the ascendant. To test his popularity, he published two poems anonymously, entitled ‘Harold the Dauntless,’ and ‘The Bridal of Triermain,’ and the reception of these pieces convinced him that his reputation as a poet was on the wane. The appearance of this memorable romance makes an epoch in the history of modern literature. Its progress at the outset was slow, but after two or three months it made its way to a high place in public estimation, and in a short time the sale amounted to about twelve thousand copies. Some time previously he had removed with his family to a small estate which he had purchased near the ruins of Melrose Abbey, and to which he gave the name of Abbotsford, instead of Cartley-Hole, which it formerly possessed. Here he erected a mansion-house, and employed his leisure in the improvement of his property by planting and farming. Viewing the character of a proprietor of land as more worthy of attainment than that of a mere author, however successful, it was the great object of his ambition to be able to leave an estate to his descendants; and for this purpose he laboured incessantly on those delightful fictions which now followed each other in rapid succession from his pen. To Waverley succeeded, in 1815, ‘Guy Mannering;’ in 1816, ‘The Antiquary,’ and the first series of ‘The Tales of my Landlord,’ containing ‘The Black Dwarf’ and ‘Old Mortality;’ in 1818, ‘Roy Roy,’ and the second series of ‘The Tales of my Landlord,’ containing ‘The Heart of Mid-Lothian;’ and in 1819, the third series of ‘The Tales of my Landlord,’ comprising ‘The Bride of Lammermour,’ and ‘A Legend of Montrose.’ In 1820 he published his chivalric romance of ‘Ivanhoe,’ and in the course of the same year appeared ‘The Monastery’ and ‘The Abbot,’ the latter being a sequel to the former, and both relating to the period of Scottish history comprising the reign of the unfortunate Mary, and the regency of her brother, the earl of Moray. In only one instance had the author permitted his own prejudices to jar upon the feelings of his countrymen, by giving, in the tale of ‘Old Mortality,’ a somewhat harshly drawn, and highly coloured, delineation of the covenanters. This led to an admirable series of papers by Dr. M’Crie in the Edinburgh Christian Instructor, which were afterwards collected and published in the form of a pamphlet. Sir Walter, though the child of Presbyterian parents, was himself an Episcopalian. On the accession of George IV., Mr. Scott was, March 1820, created a baronet. In the beginning of 1821 appeared his romance of English history entitled ‘Kenilworth,’ which completed the number of twelve volumes, all published, if not entirely written, within a year. In 1822 he produced ‘The Pirate,’ and ‘The Fortunes of Nigel;’ in 1823 ‘Peveril of the Peak,’ and ‘Quentin Durward;’ in 1824 ‘St. Ronan’s Well,’ and ‘Red-gauntlet;’ in 1825 ‘Tales of the Crusaders;’ in 1826 ‘Woodstock;’ in 1827 ‘Chronicles of the Canongate,’ first series; the second series of which appeared in the following year; in 1829 ‘Ann of Gierstein;’ and in 1831 a fourth series of ‘Tales of my Landlord,’ containing ‘Count Robert of Paris,’ and ‘Castle Dangerous.’ The whole number of his novels extended to seventy-four volumes; and, besides contributing to the Edinburgh Review, during the first years of its existence, and afterwards to the Quarterly Review, he wrote for the Supplement of the sixth edition of the Encyclopaedia Britannica the articles Chivalry, Romance, and the Drama. In 1814 he edited the works of Swift, in 19 vols., with a Life of the Author, and furnished an elaborate introductory essay to the ‘Border Antiquities,’ a work in two vols. Quarto. In 1815 he made a tour of France and Belgium, and, on his return, published ‘Paul’s Letters to his Kinsfolk,’ and a poem styled ‘The Field of Waterloo,’ which he had visited in his route. In the same year he joined Mr. Robert Jameson and Mr. Henry Weber in composing a quarto volume on Icelandic antiquities. In 1818 he wrote one or two prose articles for ‘The Sale-Room,’ a short-lived periodical started by his friend Mr. John Ballantyne. 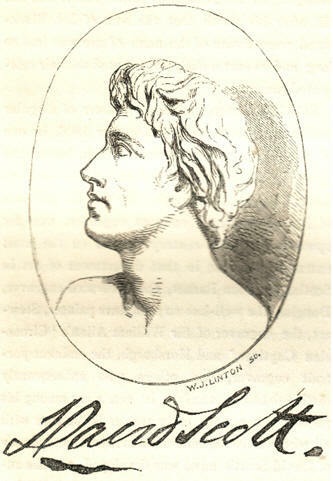 In 1819 he published an account of the Regalia of Scotland, and furnished the letter-press to the work entitled ‘Provincial Antiquities and Picturesque Scenery of Scotland.’ His dramatic poem of ‘Halidon Hill’ appeared in 1822; and, in the succeeding year, he contributed a smaller piece, under the title of ‘MacDuff’s Cross,’ to a collection of Loanna Baillie. His last attempts in this species of composition, ‘The Doom of Devorgoil,’ and ‘The Auchindrane Tragedy,’ were brought out in one volume in 1830. On George the Fourth’s arrival in Scotland in 1822, Sir Walter was commissioned by the ladies of Scotland to present an elegant jeweled cross of St. Andrew to his majesty, as a token of welcome; and in the whole proceedings connected with that auspicious event he was a prominent actor. In 1825 he visited Ireland, where he was received with every mark of distinction. The freedom of the guild of merchants in Dublin was conferred on him, and soon after he was presented by Trinity college with the honorary degree of LL.D. In January 1826 the publishing house of Constable and Co. was announced to be bankrupt, which led to the insolvency of Ballantyne and Co., with both of which firms Sir Walter was connected. It then became known that, by bill transactions and other liabilities, he had rendered himself responsible for debts to the amount of £120,000, of which not above one-half were actually incurred on his own account. This unexpected, and to any other man, overwhelming disaster he encountered with dignified and manly intrepidity. On meeting the creditors he declared his determination, if life and health were granted him, of paying off every shilling, and asked only for time to enable him to do so. He insured his life in favour of his creditors for £22,000; sold his town house and furniture, and signed a trust-deed over his own effects at Abbotsford, including an obligation to pay in cash a certain sum yearly until the debts were liquidated. On the marriage of his eldest son to Miss Jobson of Lochore, Abbotsford itself had been secured in reversion to his son. On the 15th of the subsequent May, Lady Scott died; and on Sir Walter’s return to Edinburgh, in the end of that month, he established himself in third-rate lodgings in St. David’s Street. He then set himself calmly down to the stupendous task of reducing, by his own unaided exertions, the enormous load of debt for which he had become responsible. Several disinterested offers of assistance were made to him by various persons, but these he steadily declined. The political letters which in the spring of this year he published under the signature of Sir Malachi Malagrowther, were the means of averting from Scotland that change in the monetary system which had such a disastrous effect upon England; and this is not the least of the benefits which his writings conferred upon his native country. The exposure of Constable’s affairs rendered indispensable the divulgement of the secret of the authorship of Waverley, if secret it could still be called; and the announcement was accordingly made by “the Great Unknown” himself, at the first anniversary dinner of the Edinburgh Theatrical Fund Association, in February 1827. At the time of the bankruptcy Sir Walter was engaged on a ‘Life of Napoleon;’ and in the autumn of 1826, accompanied by his younger daughter Anne, he visited Paris, to obtain certain materials for the work, of an historical and local nature, which he could only procure in the French capital. On this occasion he was received with distinguished kindness by the reigning monarch, Charles X. ‘The Life of Napoleon’ appeared in nine volumes in the summer of 1827, and is said to have produced to its author about £12,000. This, with sums derived from other sources, enabled him to pay a dividend of 6s. 8d. to his creditors. About the same time the copyright of all his past novels was bought, at public auction, by Mr. Robert Cadell, at £8,400, for the purpose of being republished in a cheap and uniform series of volumes, illustrated by notes and prefaces from the pen of the author. For his literary aid Sir Walter was to have half the profits. The new edition began to appear in 1829, and the sale was very extensive. In November 1828 Sir Walter published the first part of his Juvenile History of Scotland, under the title of ‘Tales of a Grandfather,’ being addressed to his grandson, John Hugh Lockhart, under the name of Hugh Littlejohn, Esq. In the following year appeared the second, and in 1830 the third and concluding series of that work. In the latter year he also contributed a ‘History of Scotland,’ in 2 vols., to ‘Lardner’s Cabinet Cyclopaedia;’ and ‘Letters on Demonology and Witchcraft,’ to the Family Library. In 1831 he added to his ‘Tales of a Grandfather’ a uniform series on French History. In the same year two sermons, which he had written for a young clerical friend, were published in London, and met with an extensive sale. The profits of these various publications enabled him to pay a farther dividend of 3s. in the pound, which, but for the vast accumulation of interest, would have reduced his debts to nearly one-half. Of £54,000 which had now been paid, all except about £7,000 had been produced by his own literary exertions. He had, besides, paid up the premium of the policy upon his life; and to mark their high sense of his honourable conduct, his creditors presented him with the library, manuscripts, curiosities, and plate, at Abbotsford, which had once been his own. In November 1830 he retired from his office of principal clerk of session, with the superannuation allowance usually given after twenty-three years’ service. Earl Grey, the then prime minister, offered to grant him the full salary, but he declined to accept of such a favour from one to whom he was opposed in politics. During the succeeding winter he was attacked by the symptoms of gradual paralysis, a disease hereditary in his family. His contracted limb became weaker and more painful, and his utterance began to be affected. During the summer of 1831 he grew gradually worse. It was now obvious that he had over-tasked his strength, and his physicians forbade all mental exertion, but he could not be restrained altogether from his literary labours. In the autumn a visit to Italy was recommended; and through the kind offices of Captain Basil Hall, a passage to Malta was readily obtained for him in his majesty’s ship the Barham, then fitting out for that port. He was with difficulty prevailed on to leave Scotland, but yielded at length to the entreaties of his friends, and, accompanied by his eldest son and his daughter Anne, he embarked at Portsmouth on the 27th October. His health seemed to be improved by the voyage, and on the 27th December he landed at Naples, where he was received by the king and his court with the most flattering honours. In April he proceeded to Rome, and afterwards visited Tivoli, Albani, and Frescati. His fast decaying strength, however, warned him to return to his native land, and he hurried rapidly homewards. During the journey he sustained another serious attack of apoplexy, and arrived in London in nearly the last stage of physical and mental prostration. After remaining there three weeks, in accordance with his own earnest desire, he was conveyed by the steam packet to Newhaven, near Edinburgh, and on July 11, 1832, he reached once more his favourite residence of Abbotsford. Mr. Lockhart relates, that as the carriage descended the vale of the Gala, he roused himself to a momentary consciousness, and by degrees recognized the features of that familiar landscape. After lingering in a state of insensibility till mortification had commenced in different parts of his mortal frame, he expired without a struggle, September 21, 1832, and was interred amidst the ruins of Dryburgh Abbey, his burial-place there being in right of his grandmother, Mrs. Barbara Scott of Sandyknowe, daughter of Mr. Thomas Haliburton of Newmains. A magnificent monument to his memory, from a design of Mr. George Kemp, was, some years after his death, erected in Prince’s Street, Edinburgh, for which collections were made in all parts of the country. A very handsome pillar, surmounted with a statue, was also erected in George’s Square, Glasgow. In the market-place of Selkirk there is also a statue of him in freestone. The Memoirs of Sir Walter Scott, in 7 vols. 8vo, by his son-in-law, Mr. Lockhart, were published in 1837-8. He left two sons and two daughters, none of whom survived him many years. 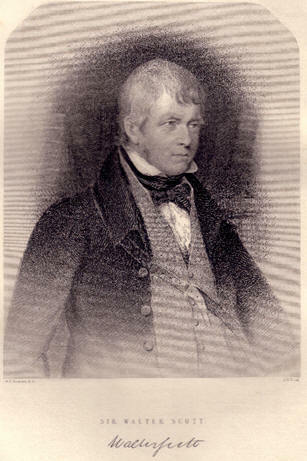 His elder son, Sir Walter Scott, second baronet of Abbotsford, was born in July 1801, and very early gave indications of a bold and manly spirit. In 1818 he was made a cornet in the corps of the Selkirkshire yeomanry cavalry, and all his studies took the direction of a military life. The following year he obtained a commission as cornet in the 18th hussars. In 1821, his regiment being one of several about that time to be reduced, he quitted England for Berlin to complete his military education there, and returned in July 1823. He afterwards spent a brief period, for the same purpose, at the Royal Military College, Sandhurst, and ere long he obtained a commission as lieutenant in the 15th or king’s hussars, in which distinguished corps his father lived to see him major. On 3d February 1825, he married Miss Jobson, the heiress of Lochore, in Fife, but had no issue. In 1839 he became lieutenant-colonel of the 15th hussars, and died at sea, off the Cape of Good Hope, 8th February 1847, of dysentery, on his return to England from Madras. He was the last surviving child of the author of Waverley. His brother, Charles, a clerk in the Foreign office, was attached to Sir John M’Neill’s embassy in Persia, and died at Teheran in November 1841. The elder daughter, Sophia, married in April 1820, Mr. John Gibson Lockhart, advocate, editor of the Quarterly Review, and died in May 1837; the younger, Anne, did not long survive her father, dying, unmarried, in June 1833. The elder son of Mr. Lockhart, John Hugh Lockhart, the “Hugh Littlejohn” of Tales of a Grandfather, always a delicate child, died in 1832, at the age of eleven. The younger, Walter Scott Lockhart, a cornet, 16th lancers, on succeeding to Abbotsford, assumed the additional name of Scott, and died, unmarried, January 10, 1853, at the early age of 27. His sister, Charlotte, married in August 1847, James Robert Hope, Esq., Queen’s Counsel, a Roman Catholic gentleman, who, in her right, on her obtaining Abbotsford, also assumed the name of Scott. Mrs. Hope Scott died in Oct. 1858, and January 7, 1861, Mr. Hope Scott married Lady Victoria Howard, eldest daughter of the 13th duke of Norfolk. SCOTT, MICHAEL, author of ‘Tom Cringle’s Log,’ born in Edinburgh, Oct. 30, 1789, received his education in that city. In 1806 he went to Jamaica. In 1822 he returned finally to Scotland, where he engaged in commercial speculations, and composed the popular and entertaining sketches, which first appeared in Blackwood’s Magazine under the title of ‘Tom Cringle’s Log,’ and which have since been collected, and published in two volumes, and also in one volume, forming part of the series of Blackwood’s Standard Novels. Notwithstanding the great interest and curiosity which this series of papers excited, Mr. Scott preserved his incognito to the last. He died at Glasgow on 7th November 1835; and it was not till after his death that the sons of Mr. Blackwood were aware of the name of one who had so long and so successfully contributed to their celebrated magazine. In 1821 he had commenced drawing in the Trustees’ Academy, Edinburgh, then under the direction of Andrew Wilson. His portrait is subjoined. In 1832 he visited Italy, taking the Louvre in his way, returning homeward by Lyons. He remained for two years in Italy, visiting every city remarkable for its collections, and in letters to his brother, gave expression to his feelings on the works of the old masters. His own carefully kept journals also contain many valuable and deeply appreciative remarks on the various pictures which he had seen. He did not, like the generality of artists, make elaborate copies of celebrated works, but only small sketches of what he conceived excellent in design. At Rome, where he remained for nearly a year, he commenced his large picture of ‘Family Discord – the household Gods destroyed,’ which, with ‘Sappho and Anacreon,’ and a series of impersonations, called ‘Morning, Noon, Evening, and Night,’ were exhibited in the rooms of the Scottish Academy. For the Roman Catholic chapel of St. Patrick’s, Edinburgh, he was employed to paint an altar piece, the ‘Taking down from the Cross.’ This splendid painting was engraved, and was the first from which copies were circulated among the subscribers to the Association for the promotion of the Fine Arts in Scotland. Sarpedon carried by Sleep and Death. Mary, Queen of Scots, receiving her Death warrant. Jane Shore found dead in the Street. Achilles addressing the manes of Patrocclus. Orestes pursued by the Furies. Christian entertained by Faith, Hope, and Charity. Merry Wives of Windsor played before Queen Elizabeth. Adam and Eve singing their Morning Hymn. Glo’ster conveyed to prison at Calais. Hope, passing over the horizon of Despair. Richard the Third receiving the children of Edward IV. The dead rising at the Crucifixion. Peter the Hermit addressing the Crusaders. The Death of the Red Cuming. Vasco de Gama encountered by the Spirit of the Cape. The Abbot of Misrule, or Christmas Mummers. Oberon and Puck listening to the Mermaid’s song. Puck fleeing before the Dawn. All Mr. Scott’s works are characterized by grandeur of conception, and power and boldness of execution. The grand and not the beautiful was his forte, and for the sake of the mysterious, he frequently sacrificed the pleasing. He was also sometimes unhappy in his choice of subjects. The love of the quaint was strongly developed in him, as it often is in minds of great depth and seriousness. In the region of the spiritual and supernatural he had no equal in art, and his happiest efforts were those which relate to the purely superhuman. He painted very few portraits. His greatest work, ‘Vasco de Gama encountered by the Spirit of the Cape,’ employed him some of the latest years of his life. A public subscription, begun before his death, was set on foot for the purchase of this picture, for the hall of the Trinity house, Leith, to which it was removed. As an art-critic, Mr. Scott showed unusual learning and great energy of thought and style. In a careful examination of the best works of the great masters, in the collections of Rome and the other Italian states and cities, he had acquired that profound knowledge of the principles of art which throughout his after-life guided his practice and distinguished both his paintings and his writings. To Blackwood’s Magazine in 1840 (Nos. 280, 284, 291, 198, and 305) he contributed an able series of papers on the characteristics of the great masters in connexion with their schools. Into the competition for decorating the new houses of parliament with pictorial subjects, he entered with enthusiasm. He prepared two cartoons of large dimensions, the one representing “the Scottish people under Wallace, stemming the tide of English aggression, at the battle of Falkirk,” the other “Sir Francis Drake on his quarter-deck, viewing the destruction of the Spanish Armada.” Both were exhibited with the numerous others, but neither was deemed worthy of a prize. For the second competition of frescos, he sent in two other works, but was again unsuccessful. This second failure visibly affected him. Tall and large-limbed, he was far from being strong, and his untiring application to his art, and constancy of study and labour, combined with many bitter disappointments, contributed to undermine his constitution. After an illness of several weeks’ duration, he died, unmarried, at Edinburgh, March 5, 1849, at the age of 42. He was simple and reserved in his manners, and in his habits somewhat austere. At the time of his death, he was engaged upon some etching illustrations to ‘The Architecture of the Heavens,’ by Professor Nichol of Glasgow, afterwards published. In January 1831 he had published a work of a singularly abstract description called “Monograms of Man,” a series of outline engravings, what may well be called metaphysical enigmas, and at a later time a series of etchings from the ‘Ancient Mariner,’ in which he thoroughly entered into the spirit and meaning of that remarkable poem. A series of forty ‘Illustrations to the Pilgrim’s Progress’ which he left behind him, were, in 1851, published by Messrs. A. Fullarton & Co.
His life, by his brother, also an artist, was published at Edinburgh in 1850, in one vol. 8vo, under the title of ‘Memoir of David Scott, R.S.A., containing his Journal in Italy, Notes of Art, and other papers, with seven illustrations. By William B. Scott.’ The work contains also selections from his poetry.